I have bred, raised and trained her. Chica is 9 years old and received correct classical training from the very beginning. She started her show career in 2015 in Training level and became Reserve Champion at Canadian Andalusian National which was her first ever show and first ever indoors. She behaved very well for the first timer. Neither other horses nor dogs or crowd bothered her. In 2016 she did First Level with scores in mid 60s, always placing no less then second. 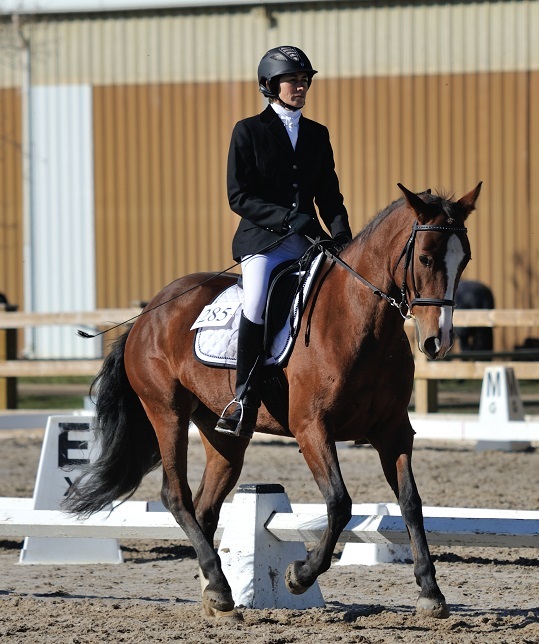 Last spring she debuted in Second Level with score 72% and has received best score in all Second Level classes. The judge found her talented and elegant. Click on Photo Gallery page to see more show pictures. Chica has been working on Third level for the last year. She has trot and canter half passes, her flying changes are coming. She knows what to do just gets a bit excited about them. Her collected canter is coming very nicely. She works in a snaffle and double bridle. Chica will excel in Western dressage due to her type. Update: Chica became champion in Third Level at Harvest show at the end of September. Below is the link to her test 3 performance. Chica has been extensively hacked on trails and in the fields by herself. She is good with water, jumping small logs and walking steep downhills. She has seen all kinds of wild life including deers, moose and black bear. 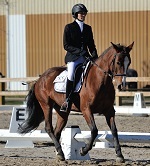 She lacks confidence in a big open space when by herself and needs calm and reassuring rider. She can be quick when spooks. Due to her sensitivity she is not a beginner or a child horse. Chica had one beautiful and healthy foal. She carried well, no complications and easy foaling. She was super mom! She stayed in work during pregnancy until last two months and got back to work one month after foaling. Photo Gallery page has more pictures of the foal. Sold. Congratulations to Stephanie. Wishing you and Chica great success together! My blog is about teaching, riding and training. I share what is important to me in my work with horses and riders. The writing helps me to think things over and have a better understanding of training ideas and priciples. © 2007-2018 Irina Yastrebova. All Rights Reserved.